Fajita is a Tex-Mex pint sized term for little meat strips. The word fajita did not appear in print until 1971, according to the Oxford English Dictionary. The exact time in which the dish was named fajita is unclear. Fajita is taken from the Spanish word “Faja” meaning “strip”, “band”, “sash”, or “belt”, and that would make sense, as fajitas are strips of meat. Fajitas are really a Tex-Mex invention. The ingredients used are some popular ones used in Mexico. But the Mexican did not make the first Fajita. 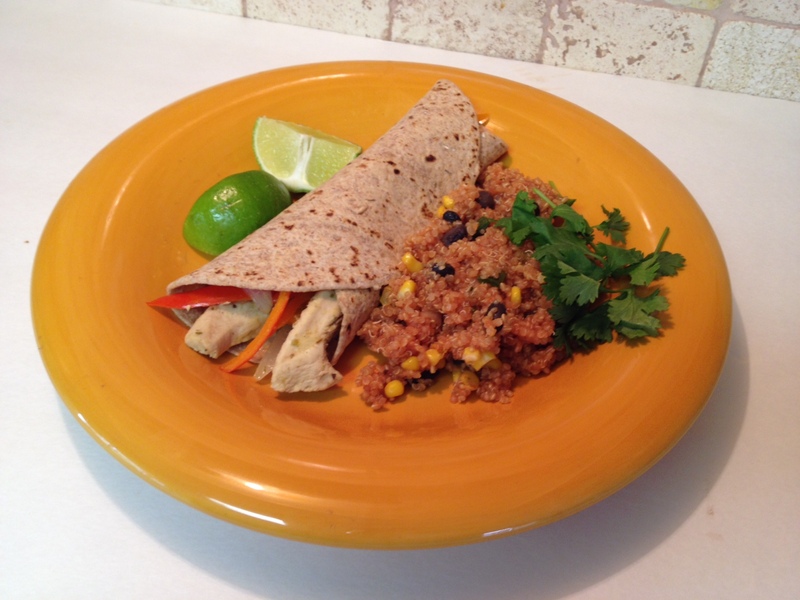 Now for our featured recipe: Garlic Lime Chicken Fajitas, and here is what you will need. Place all of the spice in a small mixing bowl. To the dry spices add 3 tablespoons of lime juice (fresh juice from half a lime), 2 tablespoons of olive oil, and 1/2 teaspoon of Himalayan salt or sea salt. I personal use Himalayan salt as it has all of the trace minerals the body needs, it is unlike table salt which has had all other minerals remove. Also when using sea salt or the Himalayan salt you can use less, than you would if using the table salt. 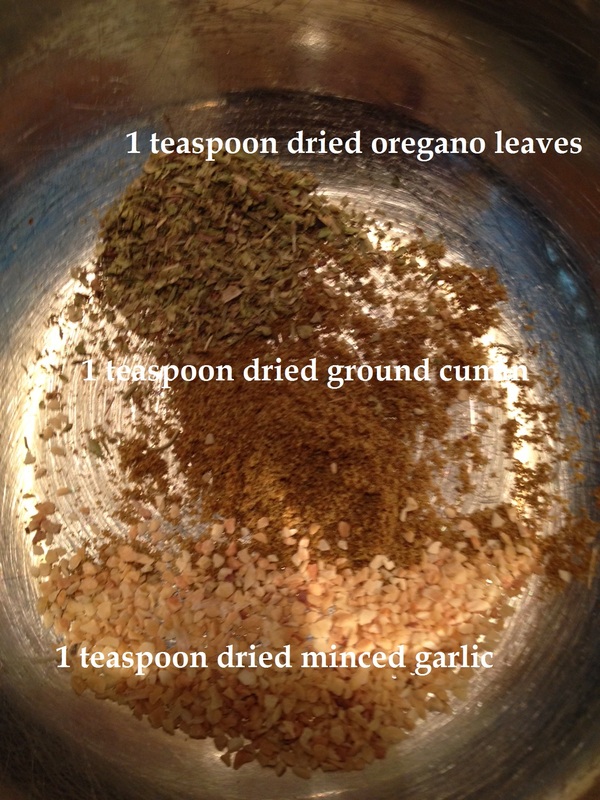 Now that the wet ingredients have been added, mix in well with the dried spices. Set the bowl aside. You will need one pound of chicken breast. It may not seem like much, as one pound is two breasts, but once they have been cut into to strips, you have plenty of meat, for 4 to 6 servings. I don’t like using plastic bags or any plastic container to store left overs, as plastic doesn’t breath, and the food spoils faster. I only use plastic freezer bags to freeze vegetables and meats. But I make an exception to marinade meat, as it is in the bag a short time. Take the chciken strips and place them into the bag and pour in the spice mix, using a spatula to scrape the bowl and get every drop of mix. Seal the bag and put into the refridgerator for 30 minutes or more. Before removing the meat from the refrigerator to cook, slice into strips 6 to 7 sweet peppers using red, orange and yellow colors. 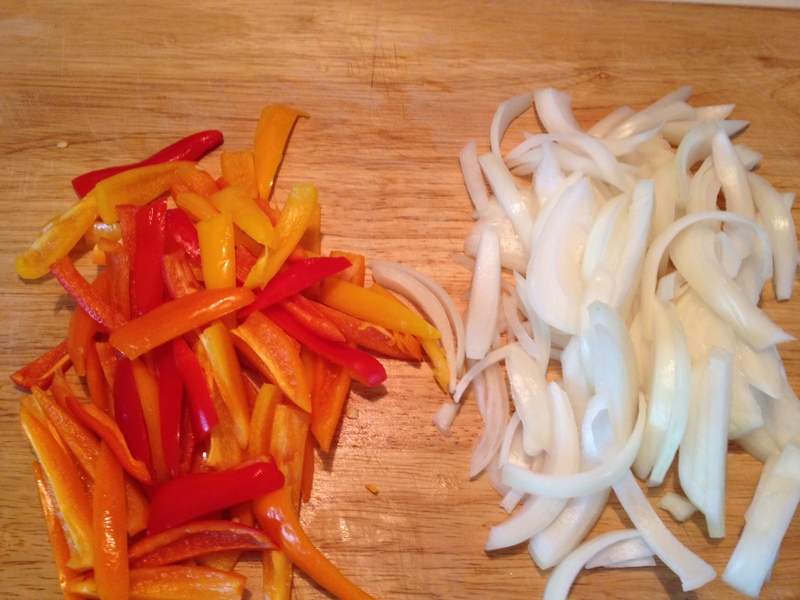 Also cut into thin slice one small yellow onion, and set aside. Heat a large ceramic coated frying pain on medium-high heat. Add the chicken and any marinade, and cook for 5 minutes while stir continuously. Next add the sweet peppers and onion, mis in and continue to stir while cooking for 2 to 3 minutes more or until the vegetables are tender-crisp and the chicken is cooked through (165 degrees internal temperature). 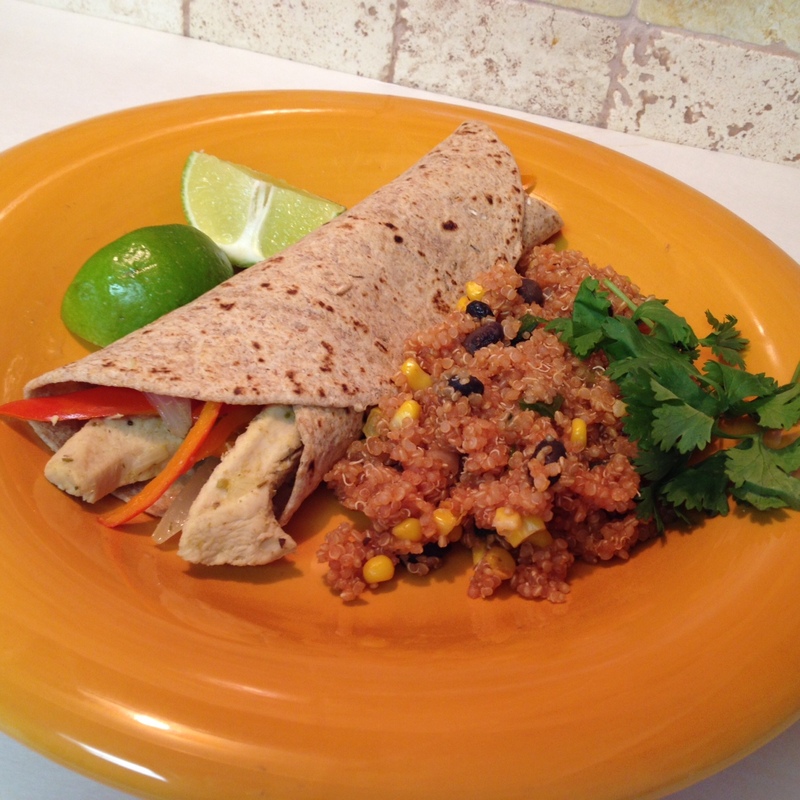 Warm some 100% whole wheat flour tortillas and spoon chicken mixture and roll up. Serve with assorted toppings, if desired. Here we have a side of quinoa with black beans, onion, corn, and chili pepper mixed in. We prepared the quinoa according to packaged instructions, using one cup of quinoa, and one cup of chicken broth and 8 ounces of tomato sauce. For dessert, check out our favorite coffee cake: Chocolate Mexican Coffee Cake, and to be honest with you, we don’t know if it is a Mexican recipe original, but it sure tastes good!! This entry was posted in Chicken, Main Dish and tagged Chicken Fajitas, Fajita, Fajita Seasoning, Himalayan salt, Lime Chicken Fajitas, Marination, Meat, Mexican cuisine, Mexico, Spice mix, Teaspoon, Tex-Mex. Bookmark the permalink. Yes it is Adrian. I didn’t mention in the post, but from start to finish is about 50 minutes if you let the meat marinade for 30 minutes. Also it was yummy with the mix of spices, lime juice, and vegetables. Thanks Adrian for your thoughts and for stopping by.